There’s a new battleground in the wars pitting transportation alternatives against cities. Milwaukee recently took legal action against Bird, a privately-operated dockless scooter company that is one of many trying to colonize city streets, as reported by the Milwaukee Journal-Sentinel. California-based Bird dropped off 100 motorized scooters in downtown Milwaukee last month, but Deputy City Attorney Adam Stephens wrote a letter to the company warning that “Bird’s Motorized Scooters may NOT be lawfully operated on any public street or sidewalk in the City of Milwaukee." According to the complaint, Bird refused to cease operations, leading to the lawsuit. Bird sees it differently. "We respectfully disagree with the city’s contention that operation of any electric scooter in the state of Wisconsin is unlawful," a Bird spokesperson told Smart Cities Dive. These rental electric scooters operate in the same way as dockless bikes—scooters are left throughout the city and customers can unlock one using an app on their phone. Following the ride, customers leave it on the street or sidewalk for the next person to use. Bird charges a fee of $1 to unlock the bike and $0.15 per minute thereafter. Other companies in the dockless vehicle-sharing industry, including Lime and Spin, have invested in dockless scooters. Major companies have seen the potential in this form of micromobility. Uber recently invested $335 million into Lime and bought Jump, and Lyft bought Motivate, parent company to Citi Bike. These acquisitions have been touted as a way to solve the first-and-last-mile problem and consolidate transportation options under one umbrella. But the controversy over regulatory issues for these new modes of transport has stopped companies from moving fully forward. Dockless vehicle companies have infiltrated cities from Miami to San Francisco, only to subsequently have cease and desist orders issued against them. As is the case in Milwaukee, one of the main concerns is the lack of designated space for these scooters. Without a dock, it becomes easy for scooters (and bikes) to pile up on the streets and create both an aesthetic and safety issue. Milwaukee officials began complaining once seeing the scooters littering on the sidewalks and outside public buildings, according to the Milwaukee Journal-Sentinel. Cities are scrambling to find a way to regulate this new mode of transport and are even cracking down on it, much like in the early days of ride-sharing companies Uber and Lyft. San Francisco ordered the removal of the scooters until the start of an official permit program and Denver seized more than 250 scooters. 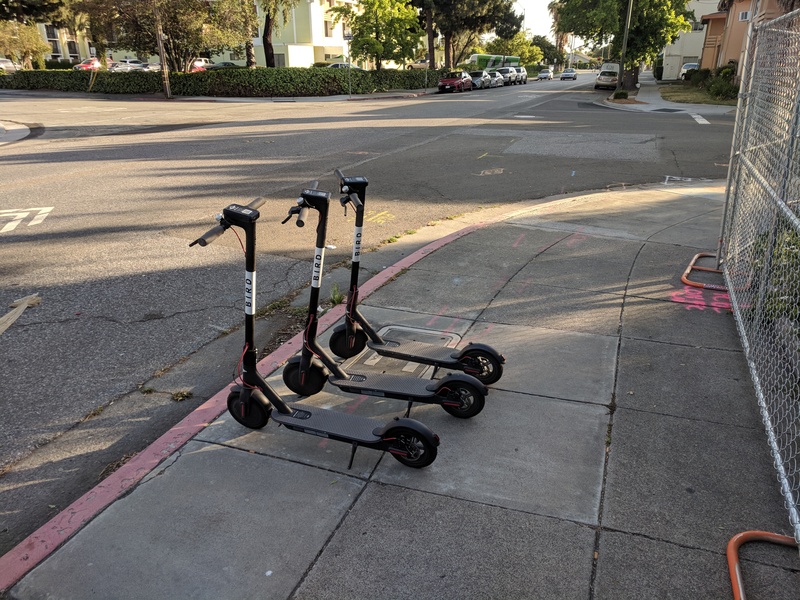 Bird has faced legal trouble in other cities before for not complying with city orders, including in Santa Monica, San Francisco, Denver, Miami, Nashville, and Austin. A hearing is scheduled for this Friday, at which time the city will be seeking a temporary injunction to remove the scooters immediately. 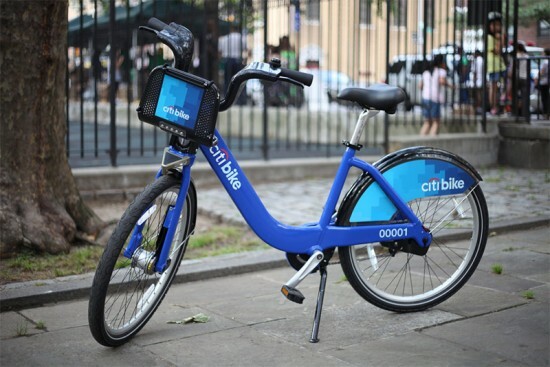 New York City Department of Transportation (NYC DOT) confirmed today what many had feared: flooding damage from Hurricane Sandy has indeed delayed New York's beleaguered Citi Bike bike share system. As AN noted last month, electrical components of the Citibike docking stations were damaged while in storage in the Brooklyn Navy Yard along the East River. The initial rollout, now scheduled for May 2013, will include at least 5,500 bikes and 293 stations in Manhattan and Brooklyn, later expanding to 7,000 bikes by the end of 2013. The final goal is to have 10,000 bikes and 600 stations across the city. The bike share system was originally set to launch in July 2012, later pushed to August 2012, and then to March 2013 as vendor Alta Bike Share sorts out computer software problems. Hurricane Sandy pushed that launch date back again to May 2013. According to a statement put out by NYC DOT, the $41 million in private money secured to fund the bike share system has not been impacted by the delays. About two thirds of the bike share system had been in storage at the Brooklyn Navy Yard, some of which will require new electrical components and refurbishing. “DOT has worked around the clock to restore vital transportation links following the storm and that includes putting Citi Bike on the road to recovery,” DOT Commissioner Janette Sadik-Khan said in a statement. “Despite the damage, New York will have the nation’s largest bike share system up and running this spring.” Many other cities across the country are also in the process of launching ambitious bike share systems of their own, including Los Angeles with 4,000 bikes, Chicago with 3,000 bikes, San Francisco with 500 bikes, and Columbus with 300 bikes. Bike advocacy group Transportation Alternatives is keeping a positive outlook. "New Yorkers are eager for this new transportation choice but we all know the damage Hurricane Sandy wrought on our city," TA Executive Director Paul Steely White said in a statement. "We're thankful the storm spared so much of the equipment and grateful to see the program will still launch in the spring." Meanwhile, be sure to check out OpenPlans' amazing CiBi.Me bike share trip planner where you can check out all the planned bike stations and plan your most efficient trip across the city by Citi Bike. 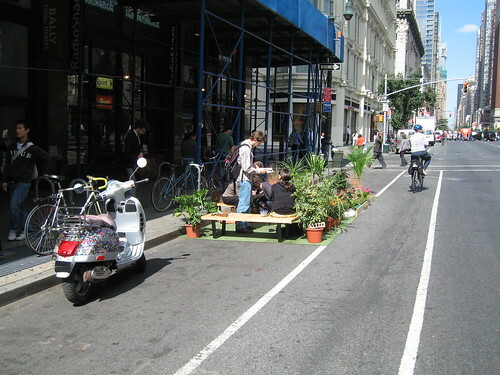 Always one to take our own advice, AN headed out for a stroll along Sixth Avenue at lunch today to check out a few of the PARK(ing) spaces that had been set up there by enterprising designers. The first stop was the Yahoo! Purple Bike Park, granted not designed by anyone we know, but it was the closest to the 14th Street 2/3 Station--part of the reason AN is such a fan of PARK(ing) Day is because AN never drives. Because there were no big plots of grass around (more on that later), we failed to find the Yahoo! park on first pass. On to Cook + Fox. Located on a harrowing stretch of the Avenue of the Americas--then again, what stretch isn't at midday--the renowned green architects had created an entirely reusable park. Instead of grass, the firm laid down green interface carpeting that can be used in the offices above, along with some plants from the Greenmarket. "We've already got spots picked out for each one," Sarah Caylor said. The centerpiece, though, had to be the green "roof." When Cook + Fox moved into its new space a year ago, they created one of the greenest offices in Manhattan, complete with a green roof. Because the landlord wouldn't allow them to build on the roof, they needed to create a less invasive system, which is comprised of one-square-foot soil bags planted with seedums. This allowed the firm to cannibalize a few dozen bags and "plant" them in the park. "We decided to use PARK(ing) Day as an opportunity to make people more aware of the potential for green spaces on the rooves of their buildings," Caylor said. "And the response has been great. Lots of people stop and stare, some pick up brochures, and quite a few have even sat down and hung out for a while." She said about 8-15 people stop by per hour, though none while we waited--granted it was lunch and the benches were already pretty full will employees on their lunch break. Up the block at the even busier intersection of Sixth Avenue and 23rd Street, a number of people stopped by during AN's visit, even though a dozen people were already crammed onto the 8'x12' sodden "park." "I saw it from my apartment window and just had to come down," Carl Zekaria said. "I'll definitely be telling my friends about it this weekend." 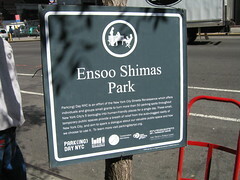 Ensoo Shimas Park--Japanese for "I am going to perform"--was a co-production of Yoshihara McKee Architects and Artec, a performing arts design consultancy. Building on the "expertise" of the latter, the team set up, in addition to their lawn, which was provided by Transporation Alternatives, and a Tuscan Red beach umbrella, was a stage. Geoff Zink, who coordinated Artec's work and has been doing a similar project in Park Slope for three years, admitted that none of his friends who were meant to play had shown up. A bango sat next to him untouched as ambulances and taxis screamed by. 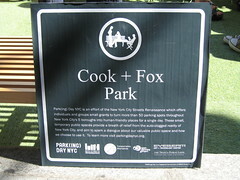 "Nonetheless, we've created a park space and it's been used all day," Zink said. "And it still achieves our goal, which is to get people to start thinking differently about how street space, how public space in general is allocated. Then they'll become advocates and all this will become mainstream." On this brisk fall day, why not hit the park for lunch, especially since there's one closer than you think. Today is the city's second annual PARK(ing) Day, an event hosted by Transportation Alternatives and the Trust for Public Space where various civic and volunteer groups have taken over parking spaces citywide--if you look at the map, it's really mostly Manhattan, and Manhattan between Houston and 34th Street at that--and turned them into "parks." This year has twice as many parks as last year, at a total of 50. But more than just expanding the size of the project, Transportation Alternatives wanted to test the limits of what these pocket open spaces could be. 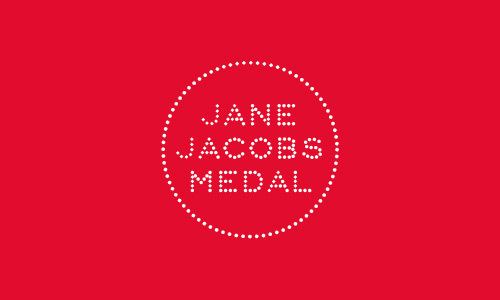 This led to a partnership with the local AIA chapter and the Center for Architecture, who led an outreach effort to get designers involved. "What I like best is how each of their spaces really represents what architects and planners would do with 100 square feet of street space, if they had their way," Wiley Norvell, the communications director at Transportation Alternatives, wrote in an email. "It shows the latent potential of our streets as untapped public space." (It's an idea that has become increasingly popular with the Bloomberg administration, following the failure of Congestion Pricing.) PARK(ing) Day is now a national event thanks in large part to the efforts of REBAR, a San Francisco arts collective that began taking over spaces about the same time Transporation Alternatives did, in the fall of 2005--then it was just a single spot with some grass and bike parking on Bedford Avenue in Williamsburg. "The origins of this type of direct action are a little murky, but we like to think we got in pretty early," Norvell wrote. A full list of "parks" can be found through the map link above, but for the design afficionados out there, here are some points of interest. (We're headed out now to drop in on a few of them, so check back later for a full report.) Center for Architecture Park, by the Center for Architecture (AIANY), LaGuardia Pl. and Bleecker St Architecture for Humanity, by AFHNY, Madison Ave. and E. 73rd St. Buckminster Fuller Park, by the Buckminster Fuller Institute, Bedford Ave. and N. 10th St., Brooklyn City in a Box, by DEGW, Thompson St. and Spring St. Cook + Fox Park, by Cook + Fox Architects, EDAW Park, by EDAW, W. 27th St. and Broadway Ensoo Shimas Park, by Artec/YMA, 6th Ave. and W. 23rd St. High Line Park, by Friends of the High Line, 9th Ave. and W. 19th St. Noguchi Red Cube, by the Noguchi Museum, Broadway and Liberty St. Office Parking, by HR&A Advisers, Broadway and W. 58th St.